Elizabeth Kiderlen, working as a consultant for public diplomacy at the Haikou Exchange Center for Foreign Affairs, has lived in Hainan for over 13 years. "It is difficult to select only three photos to represent my relationship to the Hainan Island Miao ethnic minority," Kiderlen wrote when she submitted three photos to My China Album, all depicting her interaction with the Miao people. In 2004, Kiderlen was sent by the University of Missouri to Hebei Polytechnic University (now Hebei Union University) in Tangshan to teach English. Kiderlen moved to Hainan in 2006 where she opened the first Bed and Breakfast style hotel in Boao. Her hotel was listed as the #1 place to stay in Hainan in three editions of The Lonely Planet Guide to China. In 2017, Kiderlen led a full volunteer medical team to a remote Miao village to offer free medical consultation. Kiderlen with a Miao woman who is 90 years old. 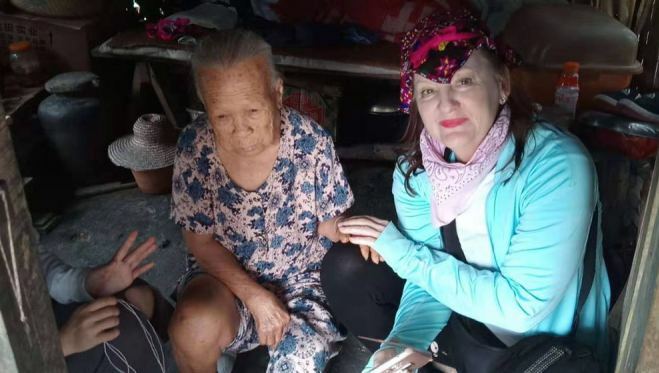 [Photo provided to chinadaily.com.cn]In one photo, she is with a Miao woman who is more than 90 years old. "She stayed in her typical Miao style house. When I stepped into the doorway, she couldn't speak words but just made noises, it was clear that she knew who I was. That's something I will never forget," said Kiderlen. In the photo, Kiderlen is wearing a Miao headdress. "That was the first time ever I put on a Miao headdress," Kiderlen said. "We were going to visit my friends, when suddenly a young lady grabbed her Miao headdress and handed it to me, she just decided at that moment to put it on my head. It felt like I crossed into another level of friendship with these people. I think it is just respectful to their culture," said Kiderlen. In another photo, Kiderlen and a young lady are smiling. "Her Chinese name is Pan Xuefeng. She was a shy little girl that hid behind her mother's skirt the first day I entered her village. Over the years, she became more confident to try to speak English to me. Now I am so happy to say she attends college in Hunan and she has said meeting me helped her choose to become an English major," Kiderlen wrote. Pan did all the translating when Kiderlen took the volunteer doctors group up to the village. "Tri-Lingual students who can speak their local dialect plus Mandarin and English are vital in connecting Hainan to the international world. Now that Hainan has its free-trade zone, we need more young people just like her. This is essential for the biggest initiatives now like the government in agriculture, and getting farmers into e-commerce, and teaching them how to get their products to market more efficiently," Kiderlen said. The third photo shows Kiderlen with Miao children and was taken in her early years in China. "The first day I arrived, they hid behind their mothers. Now they run to meet me as I always have coconut candy, fruit and milk, which I hand over to their mothers for them to distribute," Kiderlen wrote in the caption. "When I took photos around the village, the kids always came and listened to me speak English. My biggest hope is that more and more Hainanese get educated and go back to Hainan — the government needs people who know the culture. Take kids like Pan, who can speak English, Mandarin and Miao dialect, to get things done," said Kiderlen. Kiderlen said Hainan people have become like family to her and her primary concern will always be the people of Hainan. "Hainan people are the most generous, kind, loving. For the rest of my life, I will help from both the US side and the Hainan side, and always be here for them to achieve their goals, as long as I'm permitted," Kiderlen said.